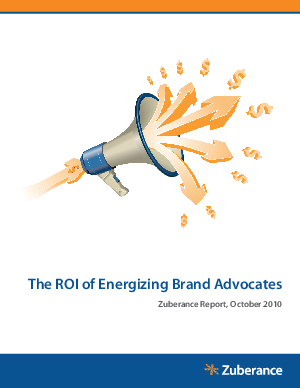 Companies that systematically identify and energize Brand Advocates are getting at least a 10X ROI in media and sales value. In other words, for every $1 a company invests in energizing Advocates, the company gets $10 in positive WOM impressions and sales. This 10X "Return on Advocacy" is significantly higher than the return that marketers get from paid search campaigns on Google and other marketing approaches.